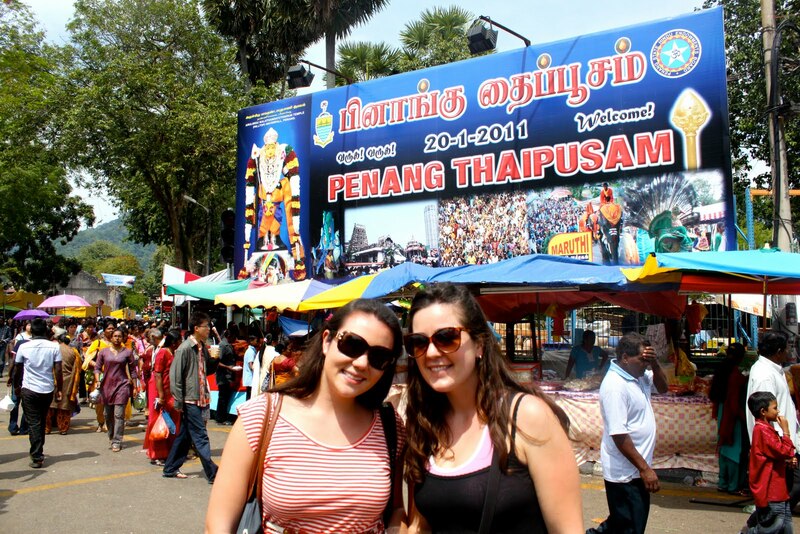 We were lucky enough to be randomly visiting Penang Island when the Thaipusam festival was going on. 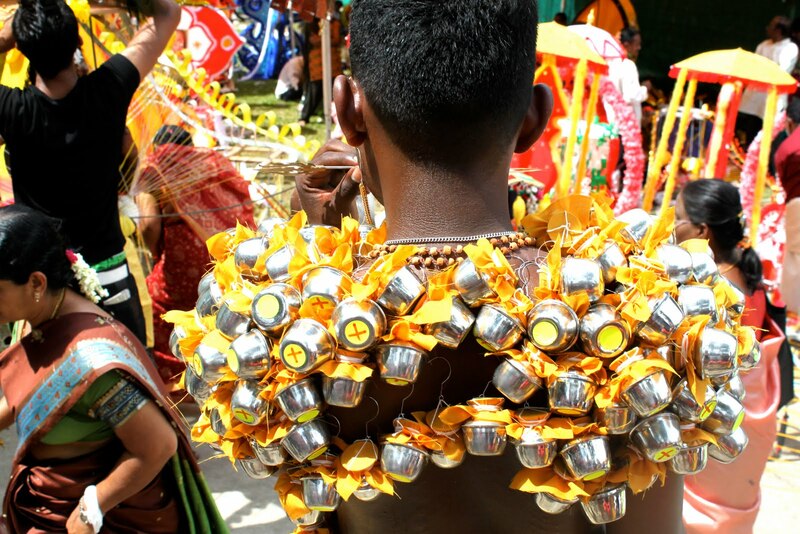 Thaipusam is a Hindu festival celebrated by the Tamil community all over the word. 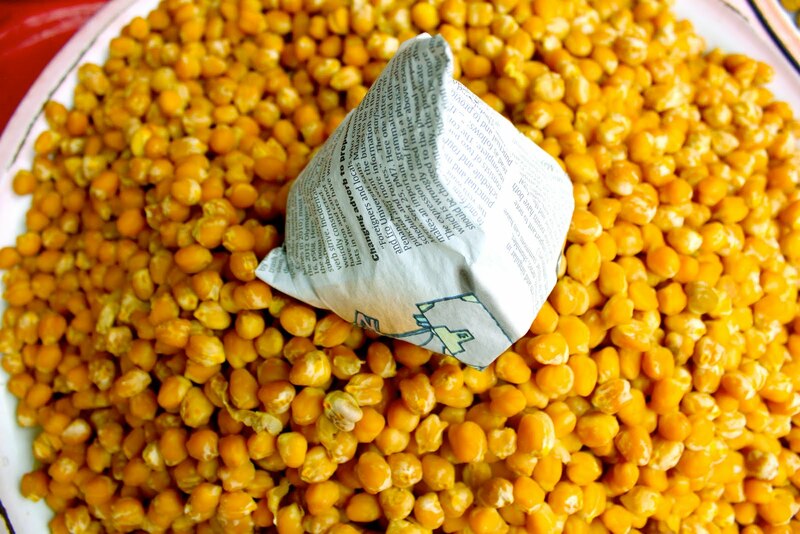 It is celebrated every year on the full moon of the Tamil month of Thai, which is usually in January or February. 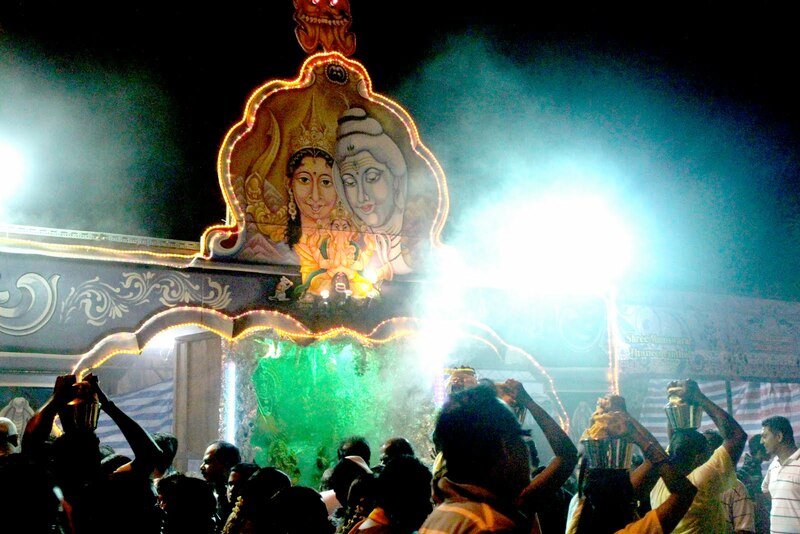 According to Wikipedia, the festival commemorates the occasion when Parvati gave Murugan a spear, so she could kill the evil demon Soorapadam. 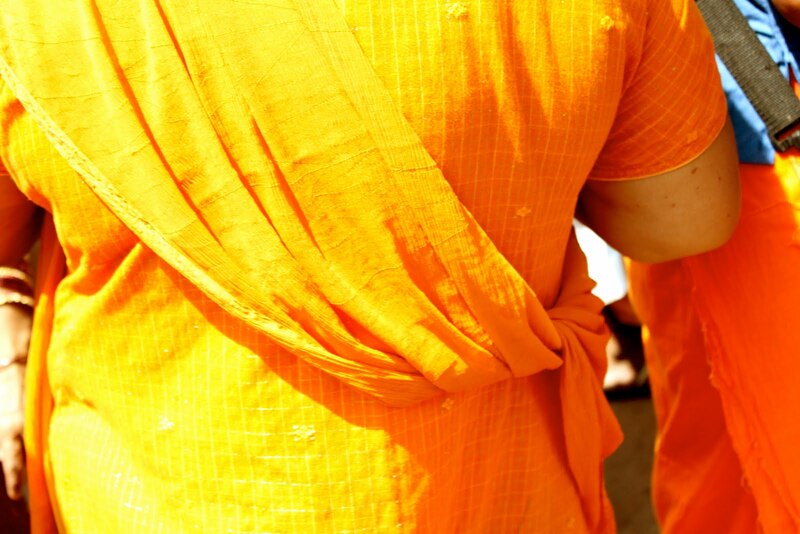 I do not know much about Hinduism or Tamil culture. 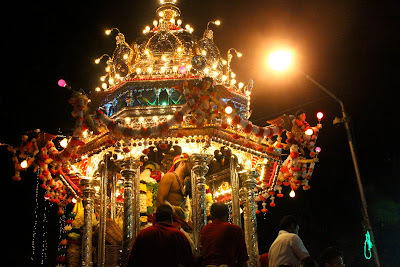 Even after spending a lot of time at the festival, talking with people, reading online, trying to learn about Thaipusam, I am still unsure of many facts. 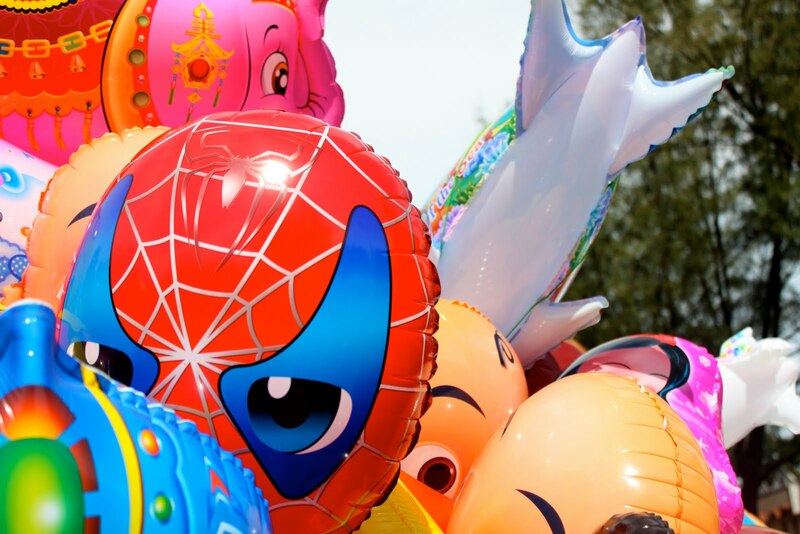 I will try to be as exact as possible however, I am sure I will miss some things! 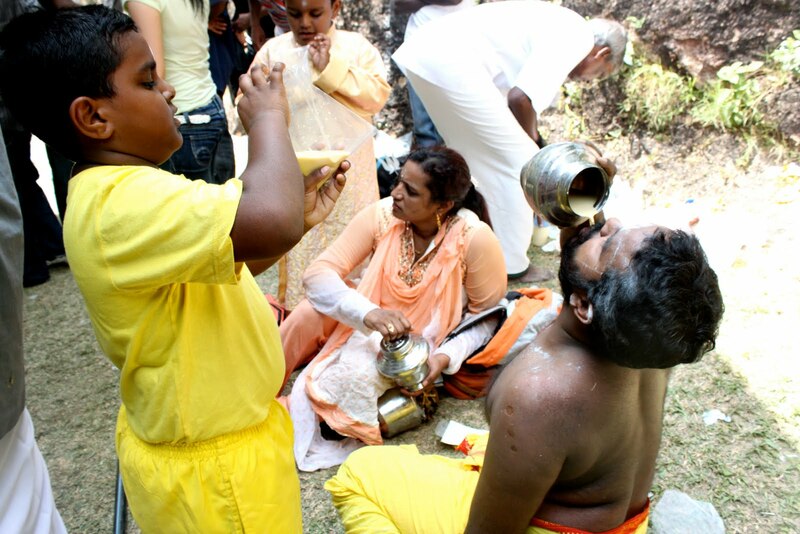 As I mentioned before, Thaipusam is celebrated all over the world. 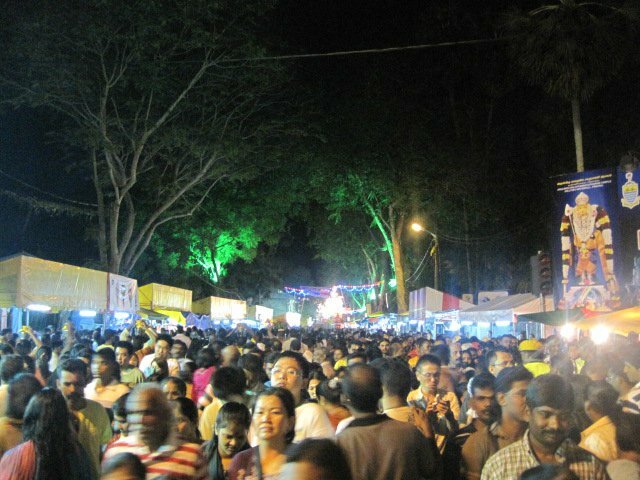 The largest festivals are held in India, Malaysia and Singapore. 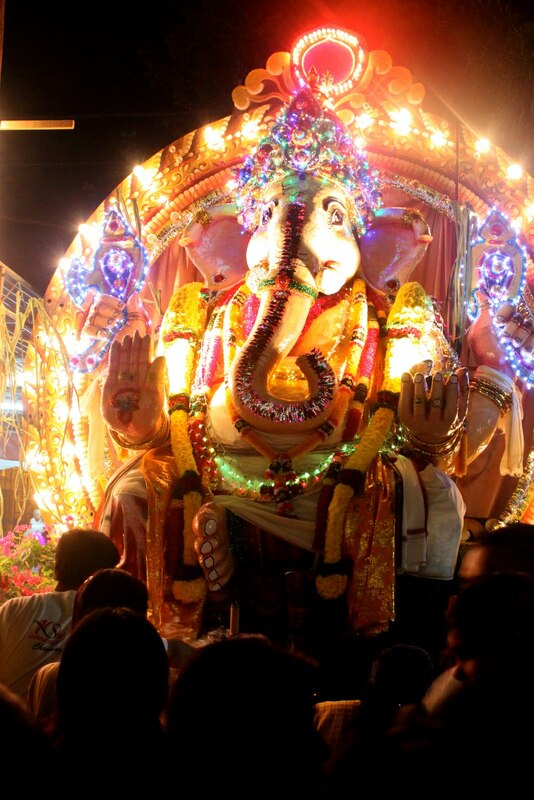 Two of the largest celebrations in Malaysia are at the Batu Caves near KL and in Penang. 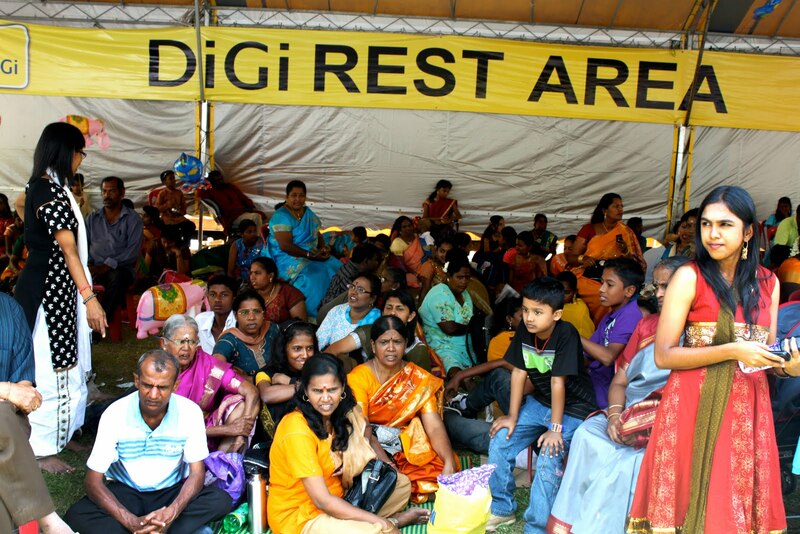 We heard from some Tamil Malaysians that the celebration at the Batu Caves are very serious and the celebrations in Penang are more fun and festive. 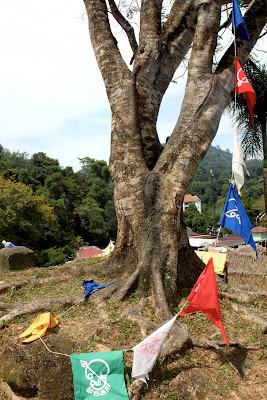 We went to the festival grounds twice, once at night and another time during the day. 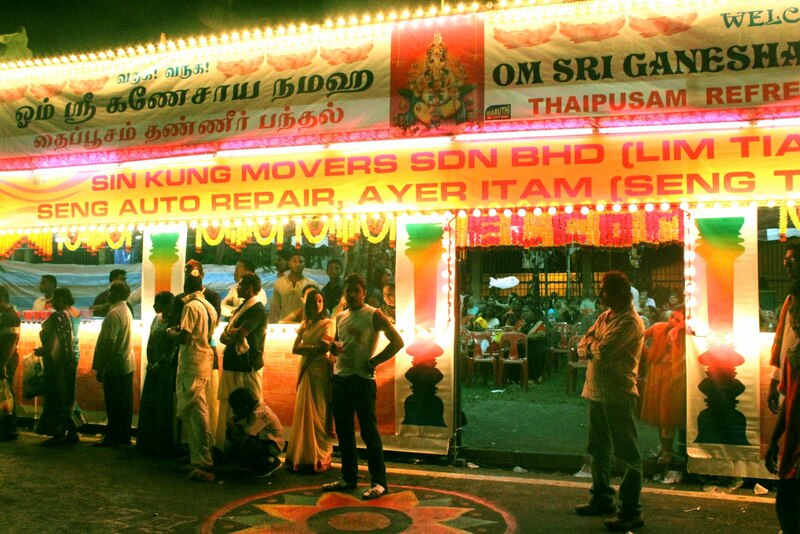 At the beginning and end of Thaipusam a bull drawn chariot with a golden statue is brought from Little India in Georgetown to the Hindu Temple, where the golden statue is kept during the festival. 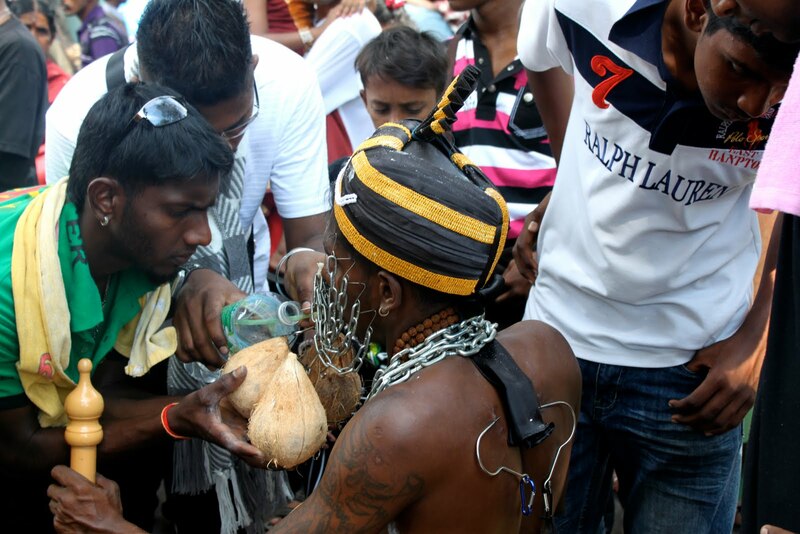 People follow the chariot's path from Little India to the Temple (a few miles) and crack coconuts along side of it. 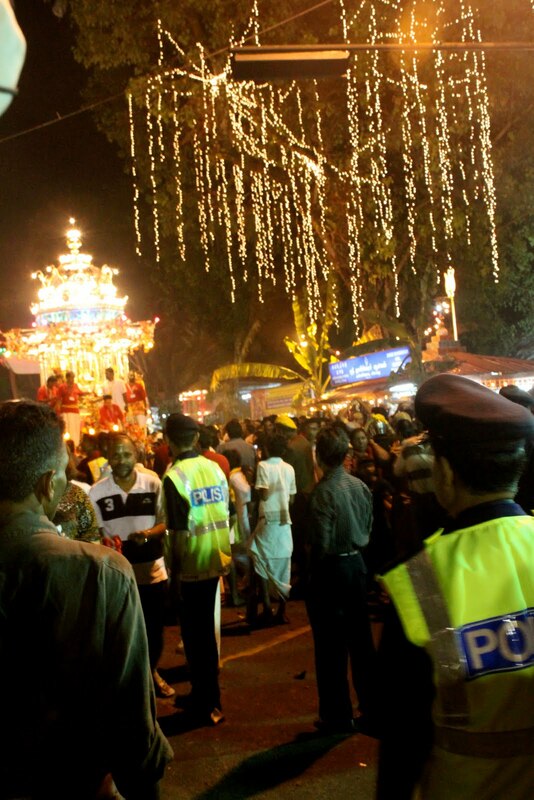 We went to see the chariot as it was approaching the temple, around midnight on the first night of Thaipusam. 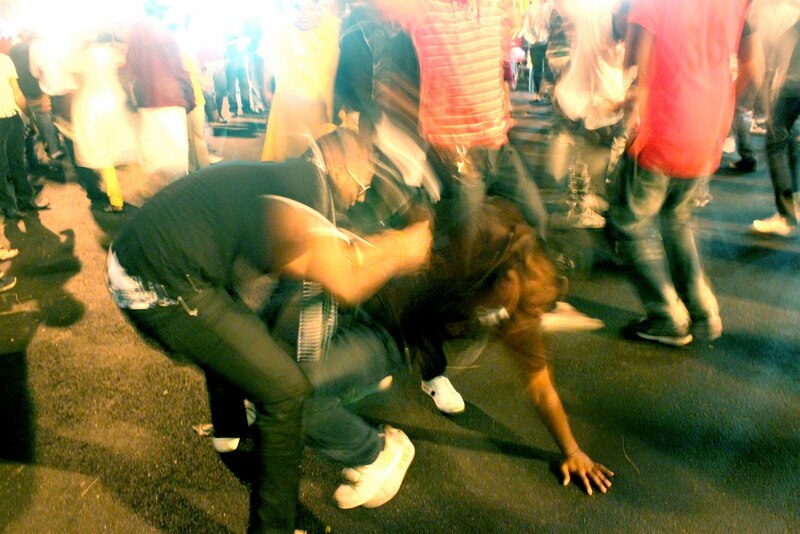 That night we noticed that this was literally the biggest party of the year for the Tamil community. 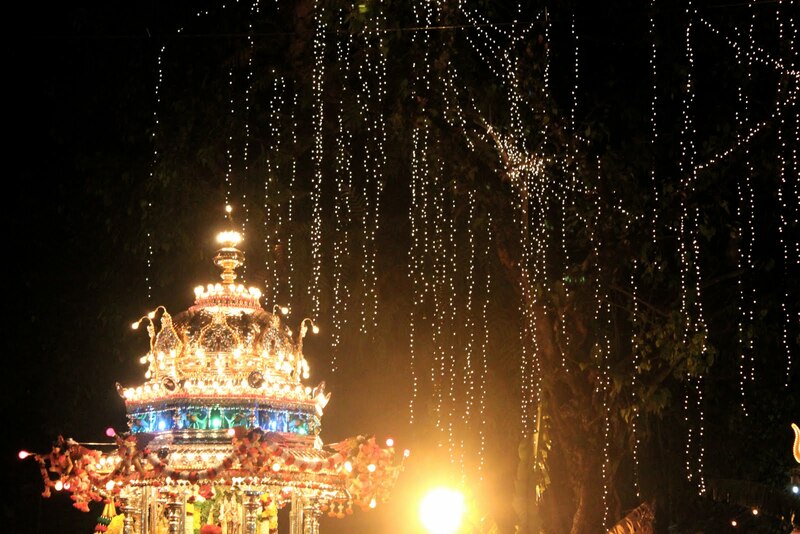 Children and families were beyond happy together, laughing and staying out to 1 or 2 am. 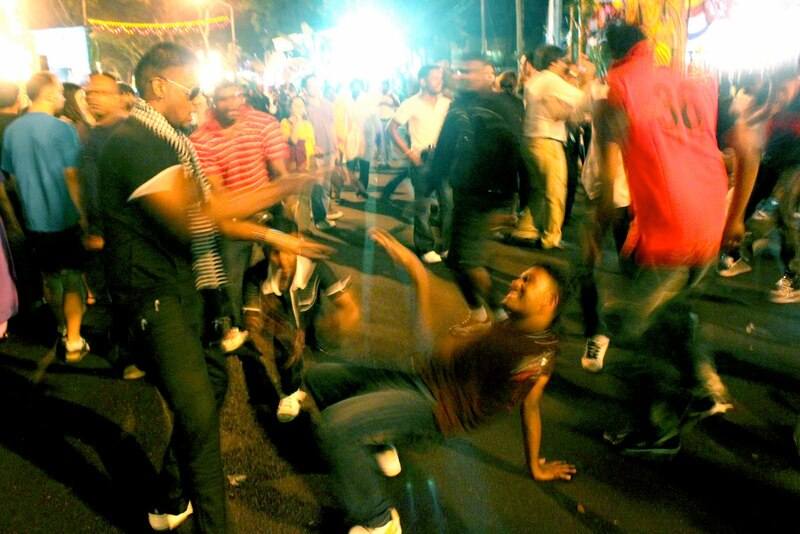 The young Tamil adults were dancing in the street to the Indian pop music like something I had never seen before. 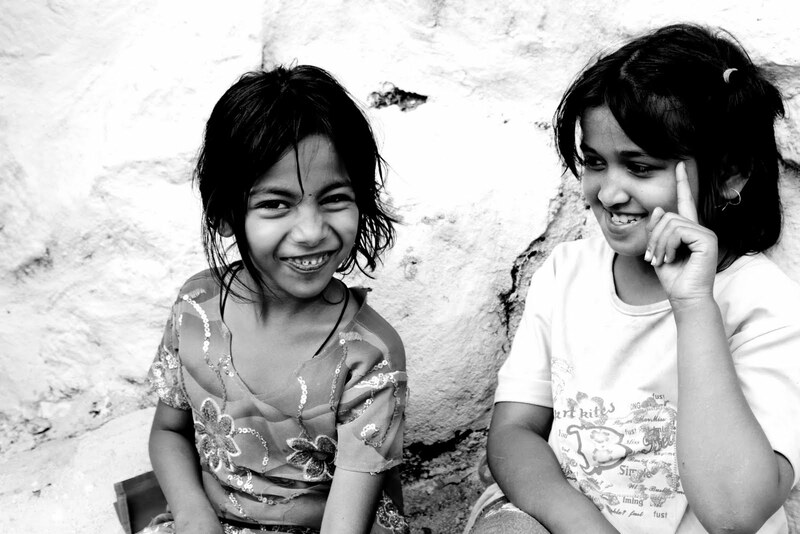 Everywhere we looked, we saw true happiness. 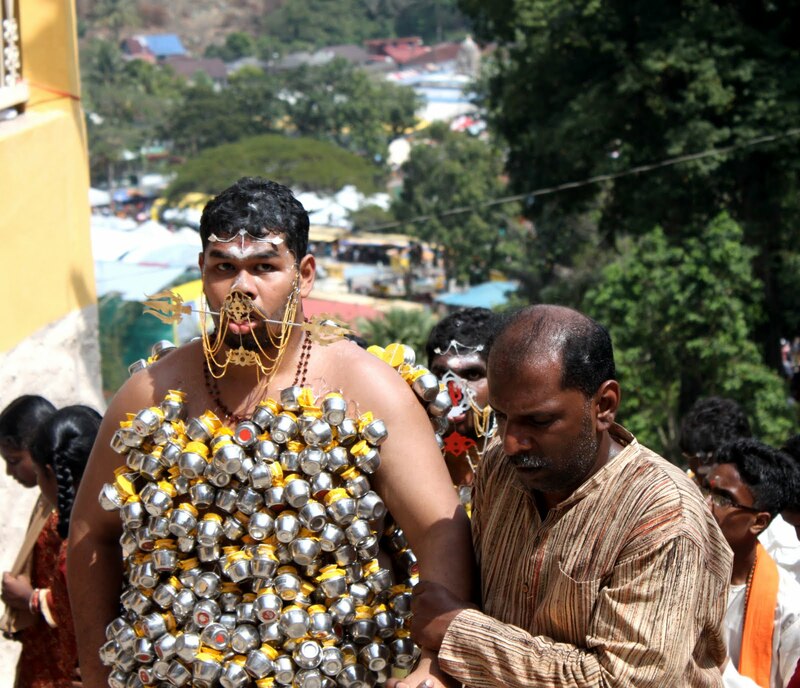 Also many people choose to have a physical burden (Kavadi) while they endure the long walk to the temple, in order to get help from Lord Murugan. 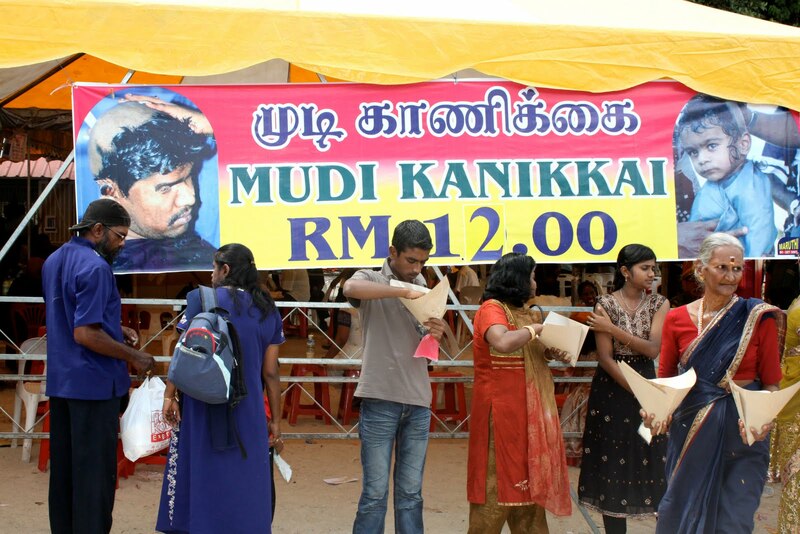 This is a very large honor in the Tamil community. 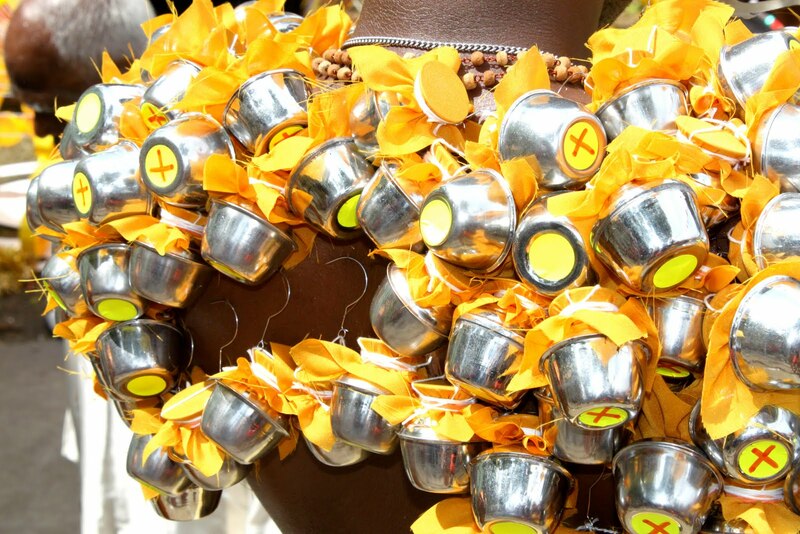 One cab driver told us, most men do it at least once in their lives, and other do it multiple times. 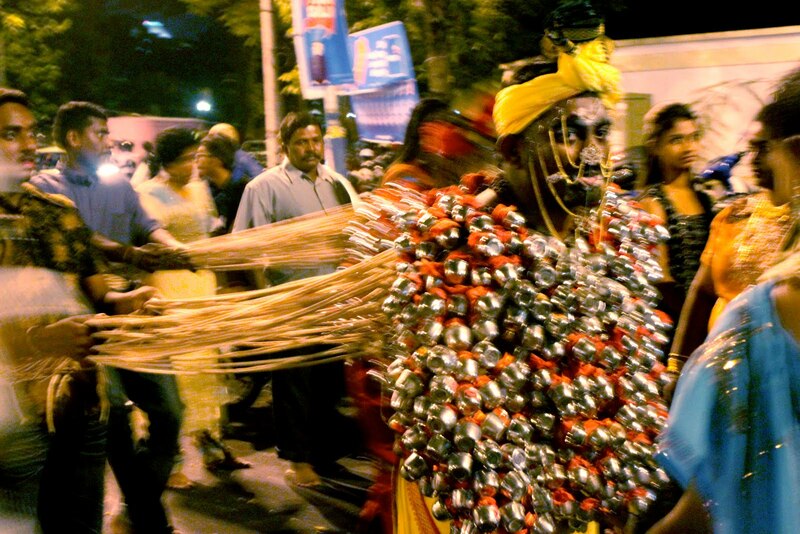 Our cabbie told us he had done Kavadi 9 times in his life and showed us the scares he had all over his body from the sacrifices. 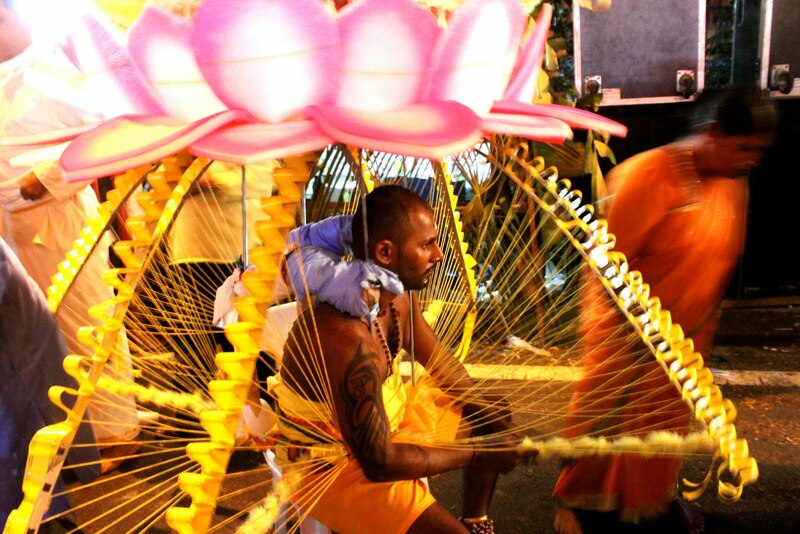 Most people practicing Kavadi are followed by their family and other devotees. 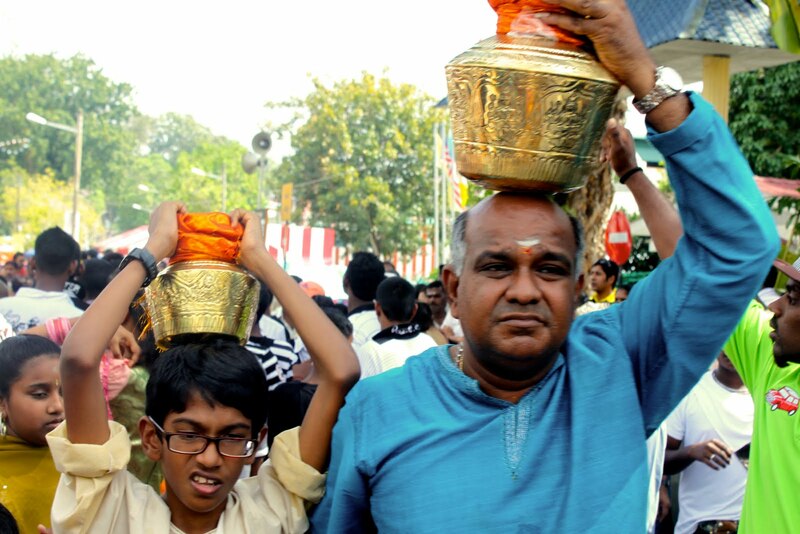 They help them with the journey from Little India to the temple by playing music, dancing and by providing chairs and water. 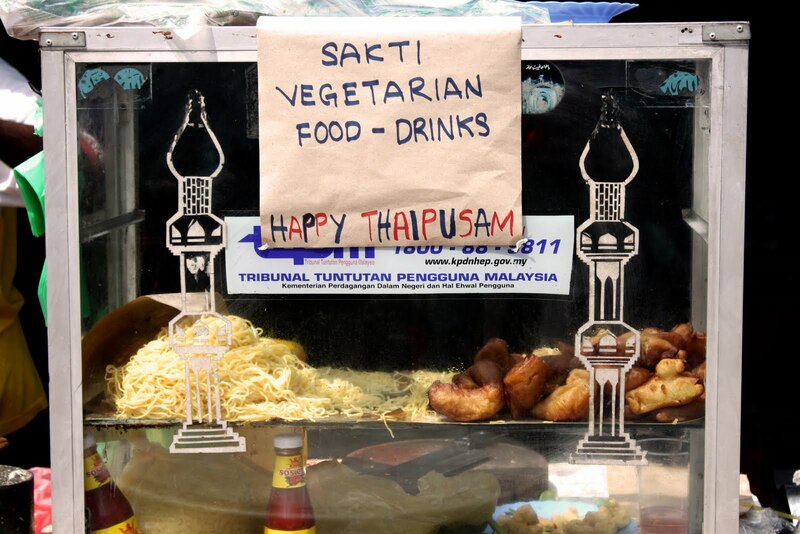 During our second visit to the Thaipusam festival we ate lots of Indian snacks, shopped at the street vender carts and talked to many people to try to learn more about the festival and the reasons behind all of practices. 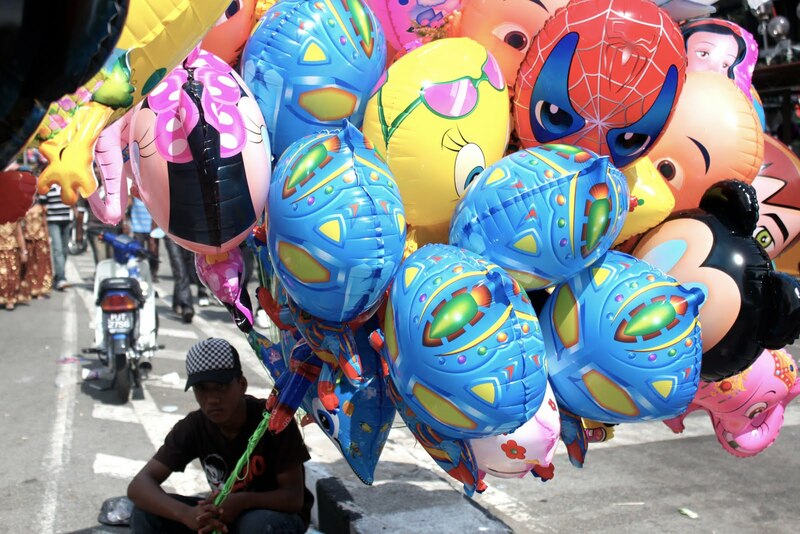 I had a slight obsession with the large, colorful balloons everyone was selling on the streets. This a Yam ice cream cone that we bought off a man who had a ice box attached to his moped. 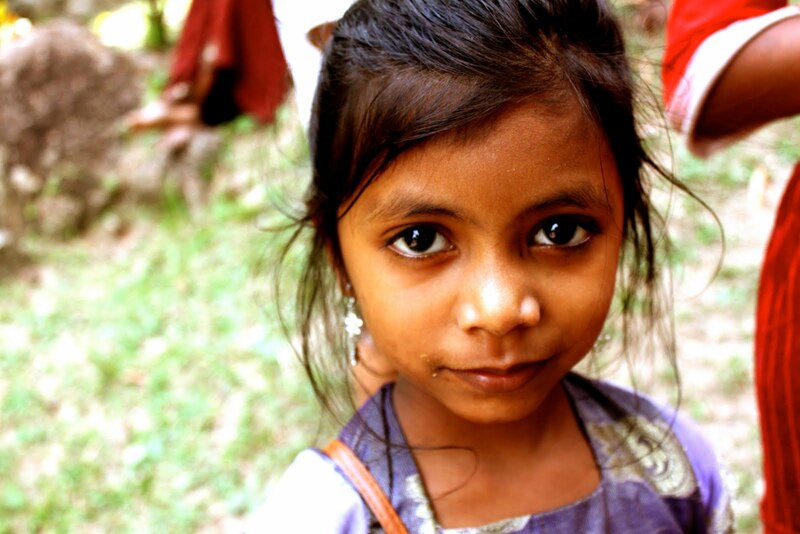 The people and children were also so beautiful. 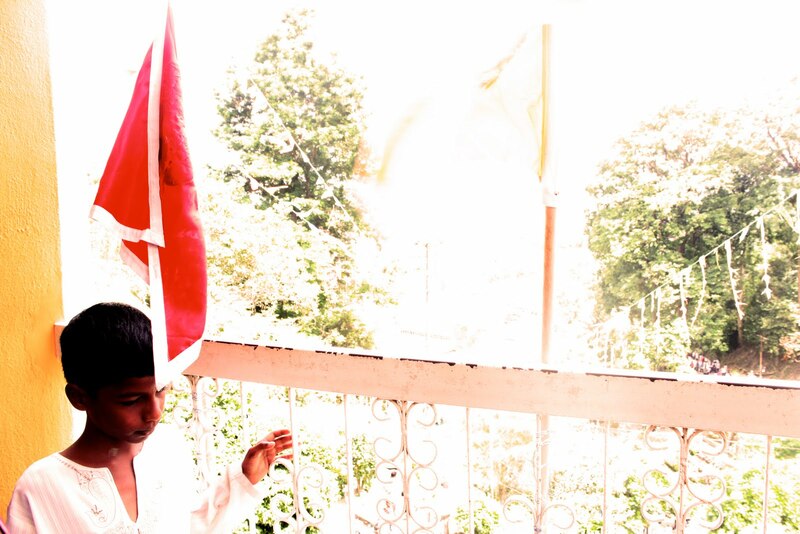 The Tamil culture is so lively and colorful, what is not to love. 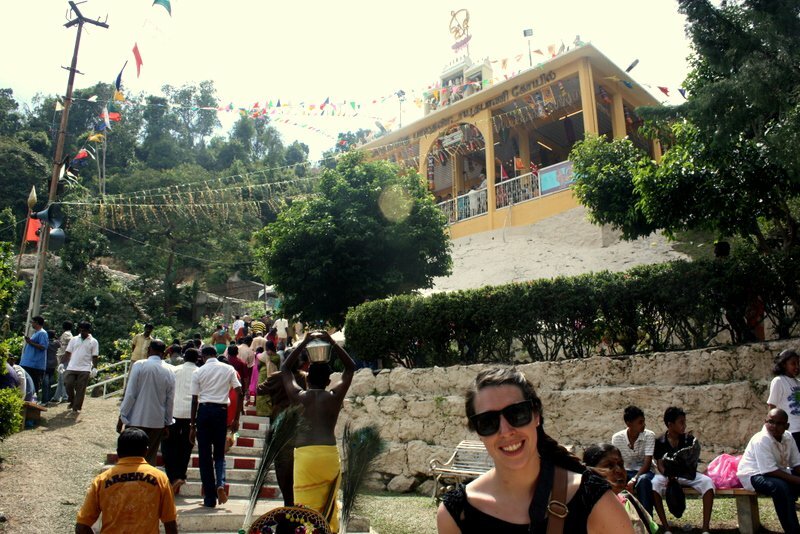 We also joined the masses and hiked up to the top of the hill to the temple, where the golden statue was being held. 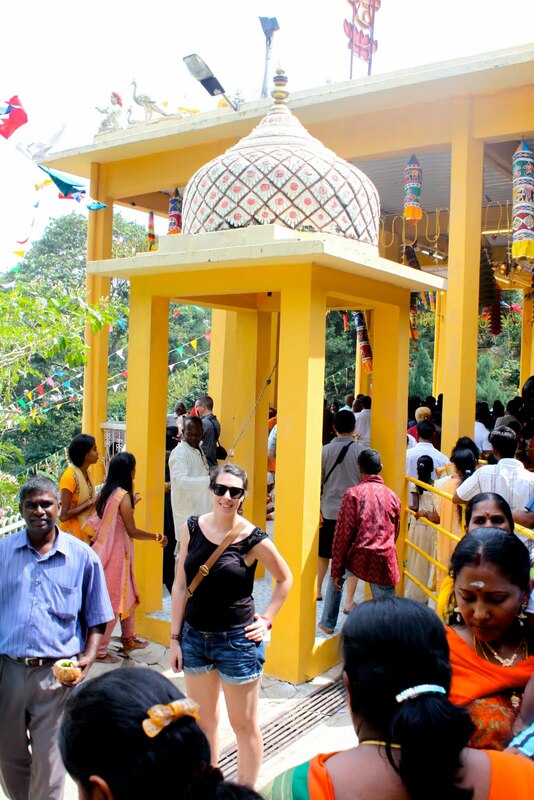 The temple was the ending destination for everyone at the festival (including the people practicing Kavadi). 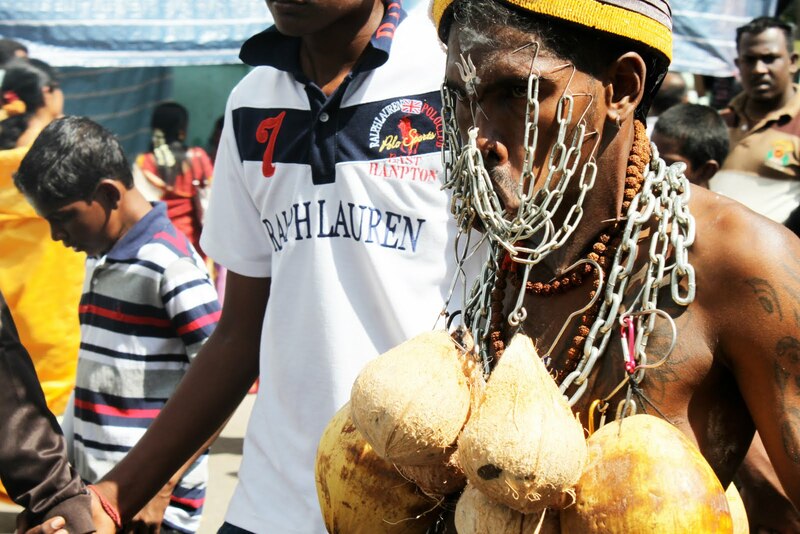 Once they got to the temple and payed their respects to the Gods, they were then allowed to take off the different things inflicting pain on them. 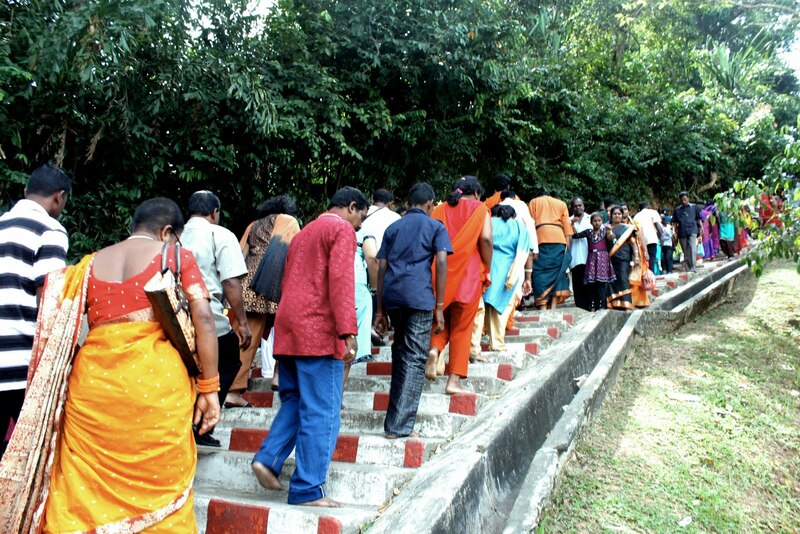 Here are pictures of people walking up to the temple and around the temple area. 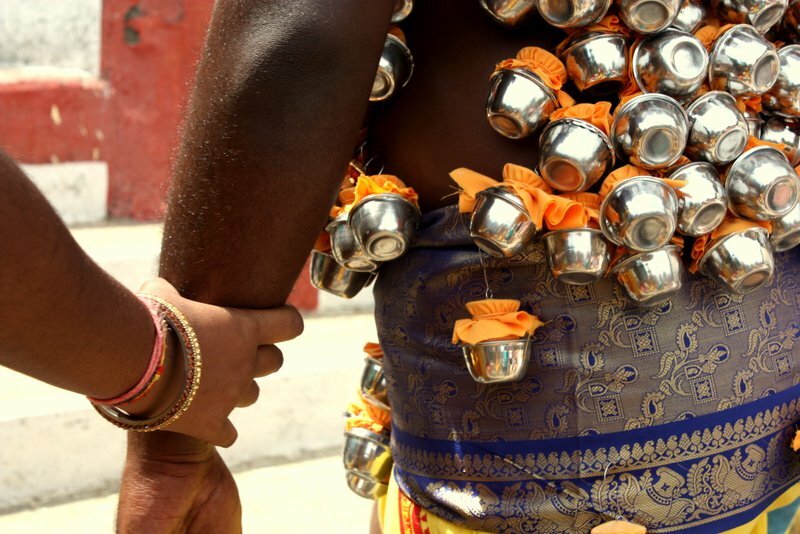 You may have noticed that many people are carrying pots and cans on top of their heads. 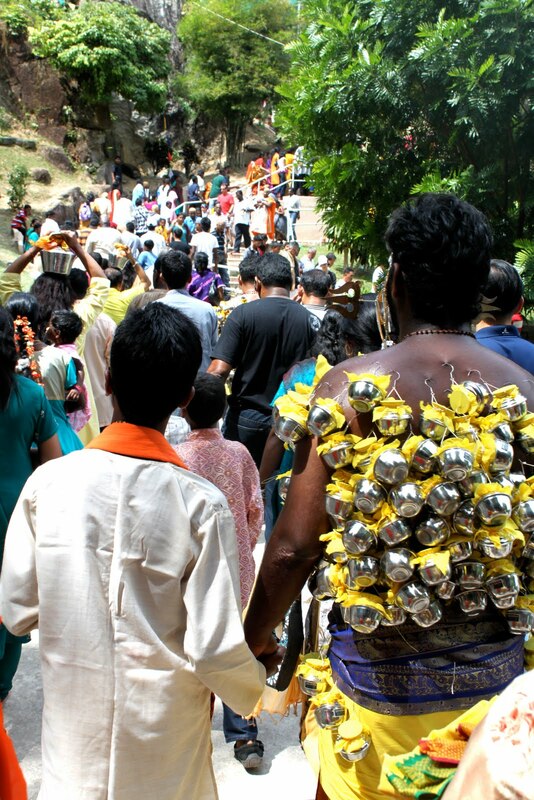 These are offerings they are carrying to the God's at the temple. 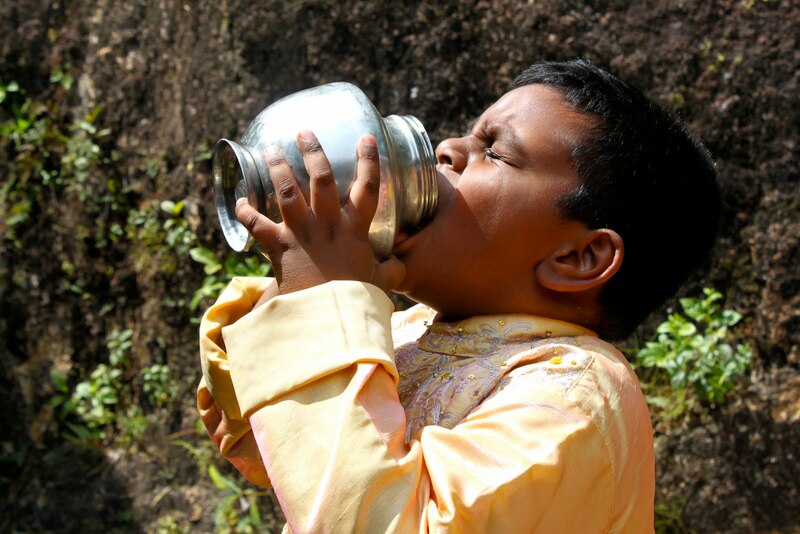 The pots can be filled with many things but a very common offering is milk. 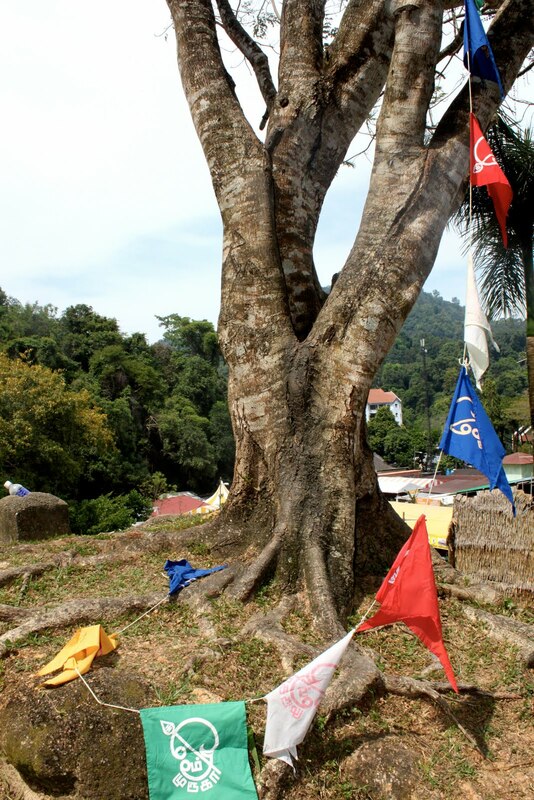 I also noticed at the top of the temple, many families sat down together and drank the milk. 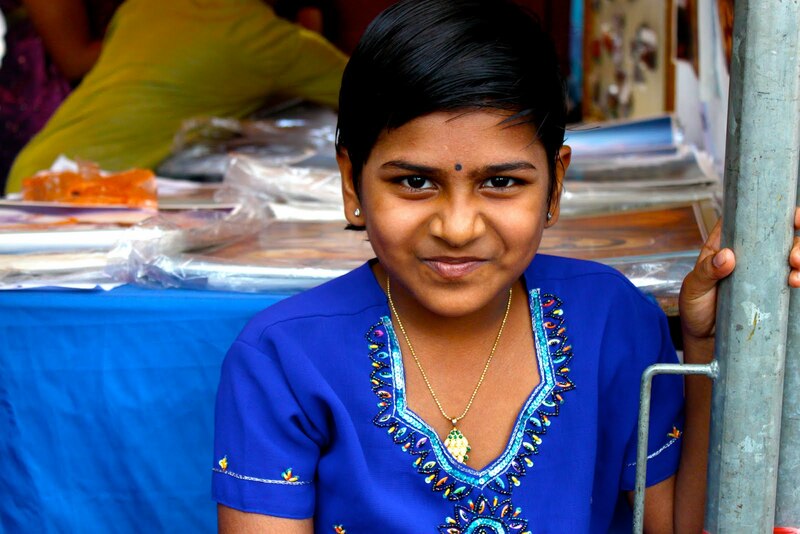 At the bottom of the temple there was a make shift barbar shop set up. 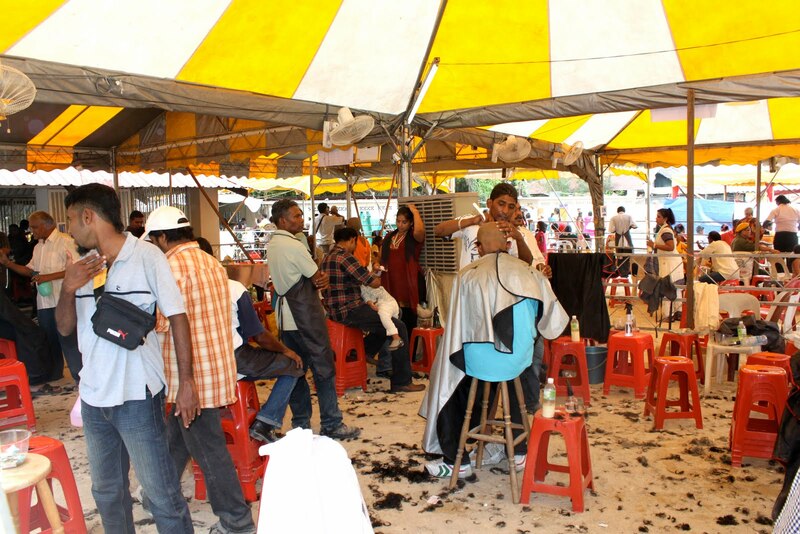 You could get your head shaved for a couple of dollars with a straight razor. 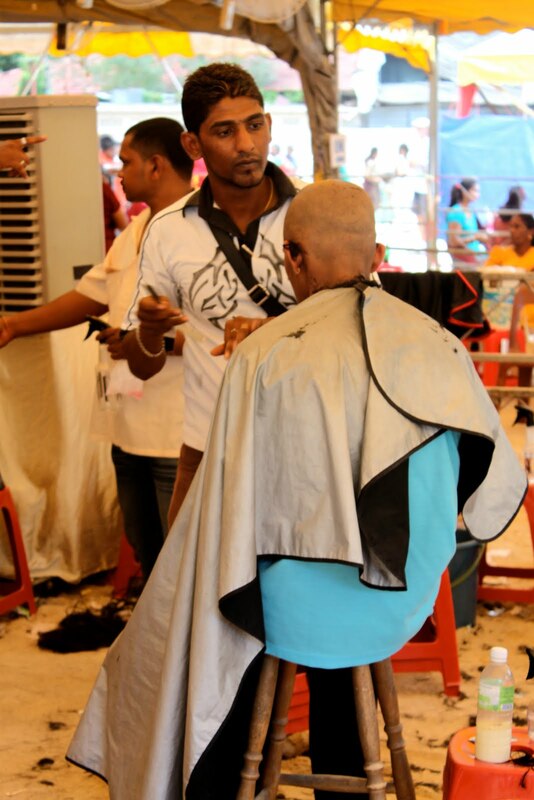 Men, women, children were getting their heads shaved. We asked around to see why this was such a big trend and people responded that it was a sign of your relationship to God. 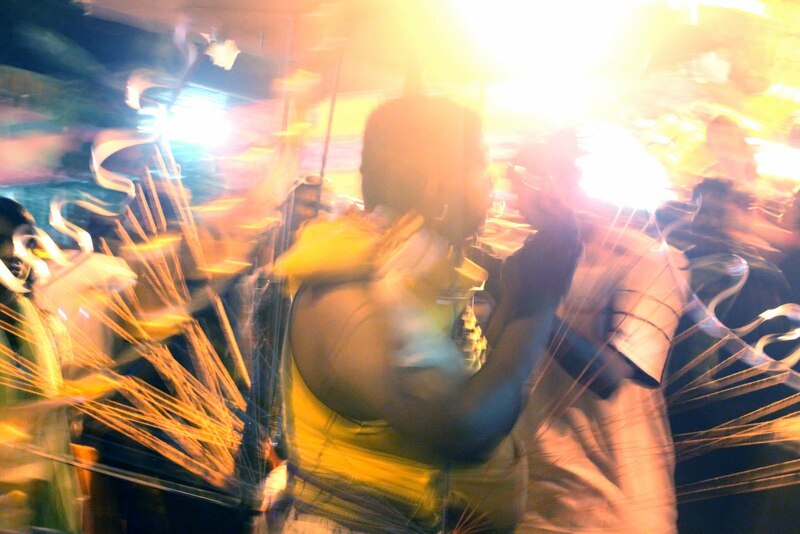 Sorry for the extraordinarily long post, but Thaipusam was one of the most exciting and interesting experiences I have ever had. 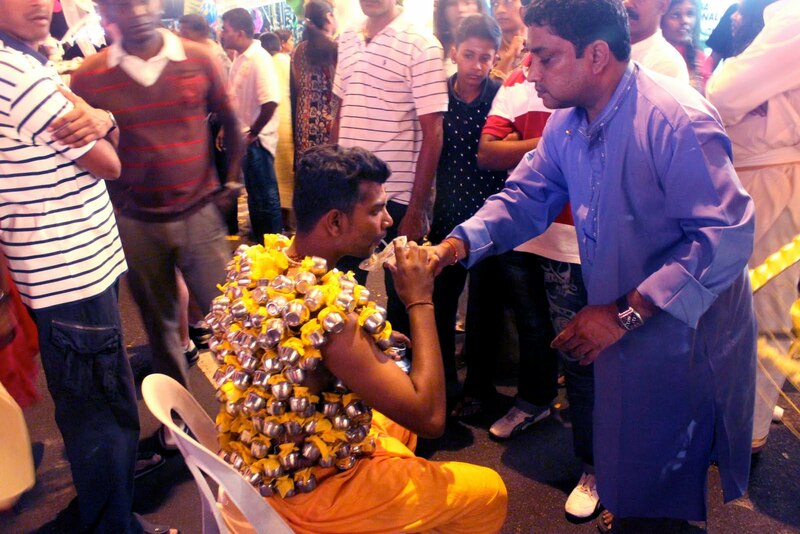 The thing about Thaipusam that stuck with me that most is that the Tamils there wanted us to be there. 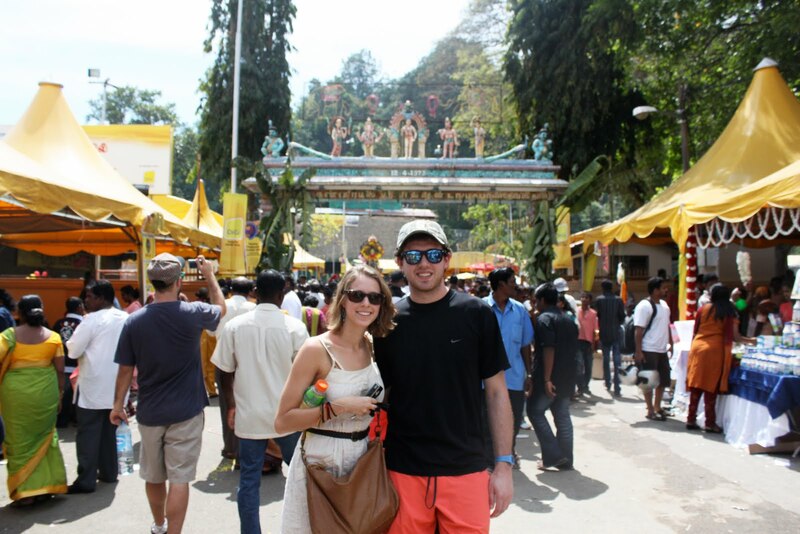 We were some of the only non Tamils at the festival and not once did I feel out of place. 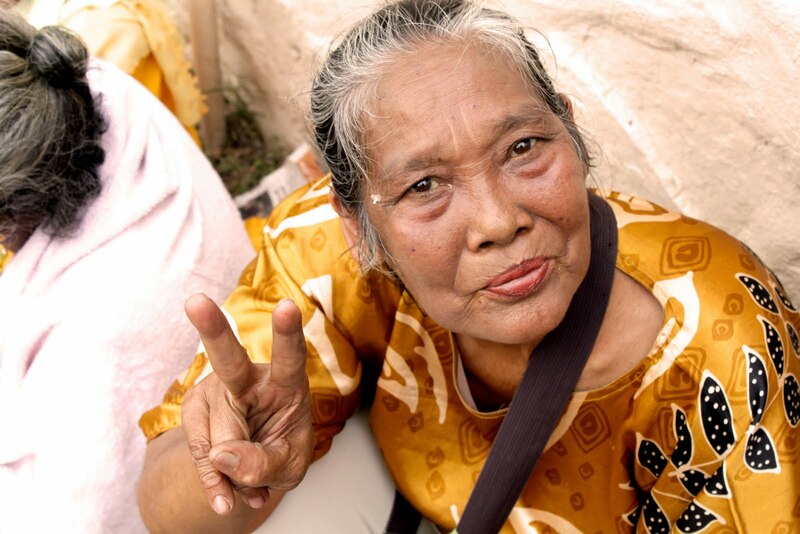 People would smile at us, even say "Thank you for coming and wanting to learn more about our culture." 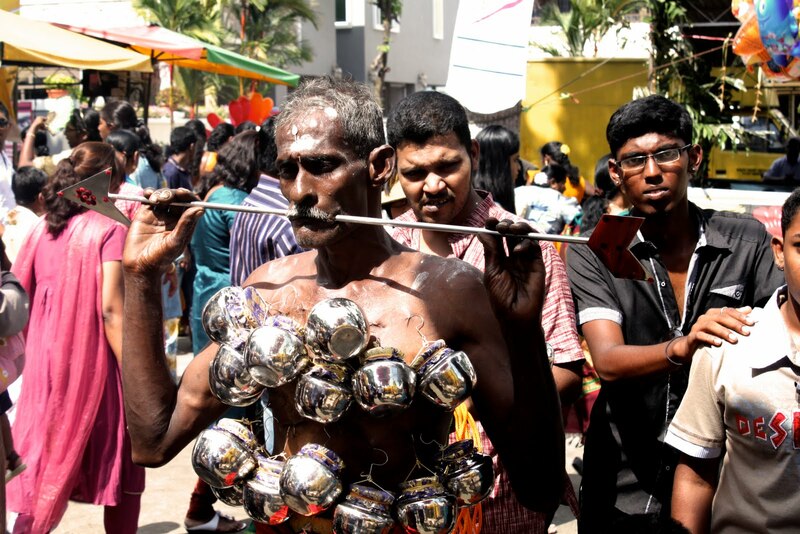 People practicing Kavadi would stop for pictures and never get angry at the curious tourists. It was such a warm and open community. 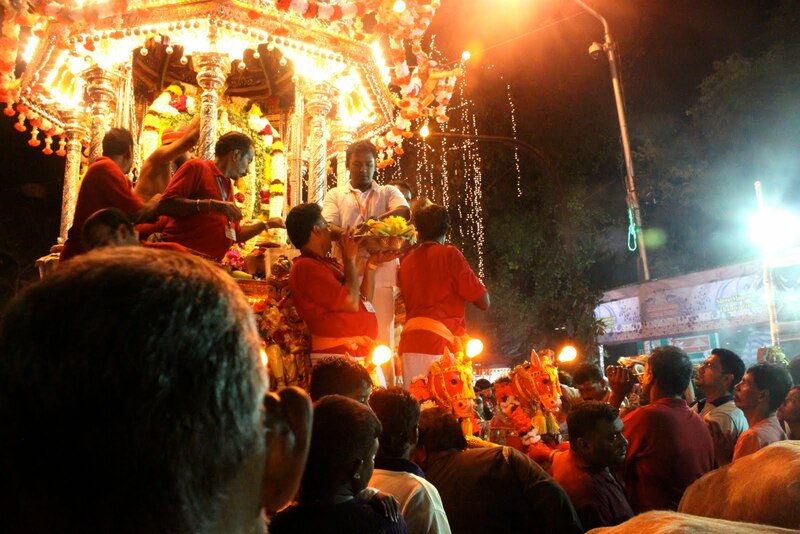 I had a wonderful time at Thaipusam and I hope that some of you will be able to experience this festival in the future!